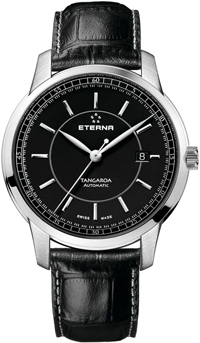 Swiss watchmaker Eterna announces the release of its new products – Tangaroa Automatic. The model is the latest addition to the collection of Tangaroa, which is named in honor of the ecological and ethnographic expedition to the South Pacific, done in 2006 on a raft “Tangaroa” along the route traveled by raft “Kon-Tiki” in 1947. The expedition to the “Tangaroa” participated grandson of Thor Heyerdahl – Olaf. The model developed by Eterna, presented in a circular enclosure with a diameter of 42 mm and 11 mm thick stainless steel. Matt – black dial has a new patch hour markers in the form of lines, the three central arrow-aperture date at “3 o’clock”. Brand logo adorns the dial set to “12:00”, and the model name – in the “6:00”. It protects the dial sapphire crystal with anti-reflective coating. The back of the model is also protected by sapphire glass, which allows to observe the work mechanism Sellita SW 200-1 to 26 stones, with a frequency of 28,800 vibrations per hour, power reserve 38 hours, as well as functions: hours, minutes, seconds, date. Complementing the new product Tangaroa Automatic black leather strap with a buckle made of stainless steel.